models and finished in stainless steel or black. 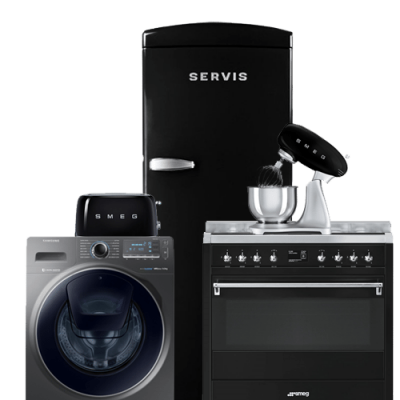 Browse a great range of high-quality appliances for every part of your kitchen. We strive to ensure you get your perfect bespoke kitchen package, with the best service from start to finish, partnered with the best possible price. Our staff are not only friendly but extremely knowledgeable and will go above and beyond to ensure that your time with us is nothing less than what you deserve. We monitor our competitors’ prices daily to ensure that we can offer our customers the best possible deals. We are more than just an online retailer. We have an incredible showroom full of all the latest products, so you can really envisage your new kitchen. Situated in a village called Bunny, just outside of Nottingham and a short drive from Loughborough, customers visit our showroom from all over the UK to get unrivalled product advice, customer service and fantastic prices. All the top kitchen appliance brands in one place. Why not use our multibuy system to get the best deal? Our multibuy system is unique. We know that you want the best deal when you’re buying multiple appliances for your kitchen, which is where our Multibuy tool comes in. Although we monitor our competitors on a daily basis to make sure you’re getting a great deal we are more than happy to discuss a further discount if you’re looking for a selection of products. Simply add your requirements to the multibuy list and submit it and one of our friendly experts will put together a package deal and come straight back to you. We’ll pull out all the stops to make sure you get the service you deserve. All the latest appliance news, promotions and updates.